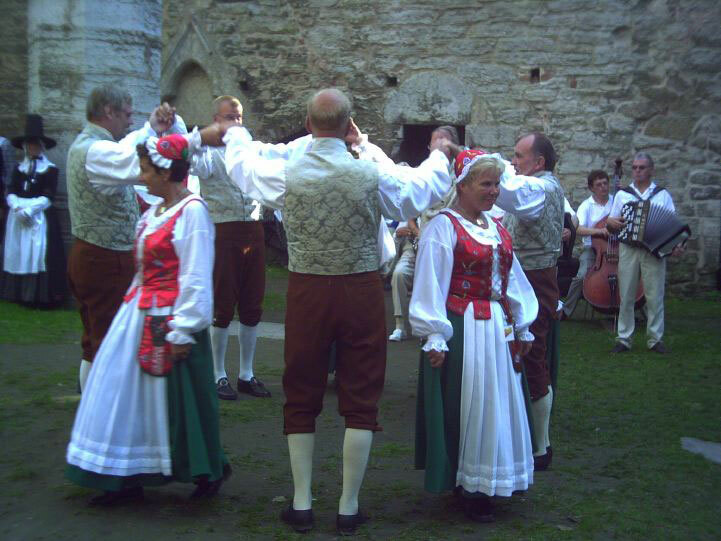 30 musicians & dancers from Visby Folkdansgille from Gotland in Sweden took the long journey from their island home, by ferry to mainland Sweden & an overnight stay in Stockholm, to the Isle of Man via Gatwick, arriving in the late afternoon of Friday 9th August. 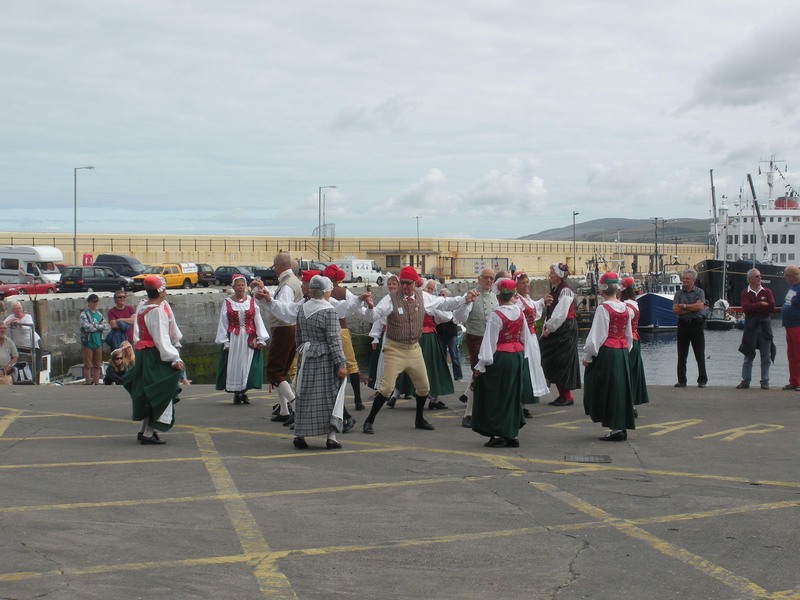 As there were so many of them they stayed in the Trevelyan Hotel in Douglas and not in family homes, which is the usual arrangement for dance groups visiting the Manx Folk Dance Society (MFDS). That evening the 2 groups got reacquainted over a Hot Pot meal in Onchan. 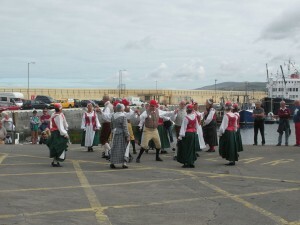 The next morning both groups, in dance costume, headed for Peel, by the scenic route so that they could dance for about 1 hour between them by the Lifeboat House, as part of the Traditional Boat Weekend Celebrations. The weather was kind and audience was good, as was the general atmosphere with such a gathering of ‘boaties’. After a delicious lunch at the Highwayman (it rained while they were eating! ), it was back down for some free time in Peel. 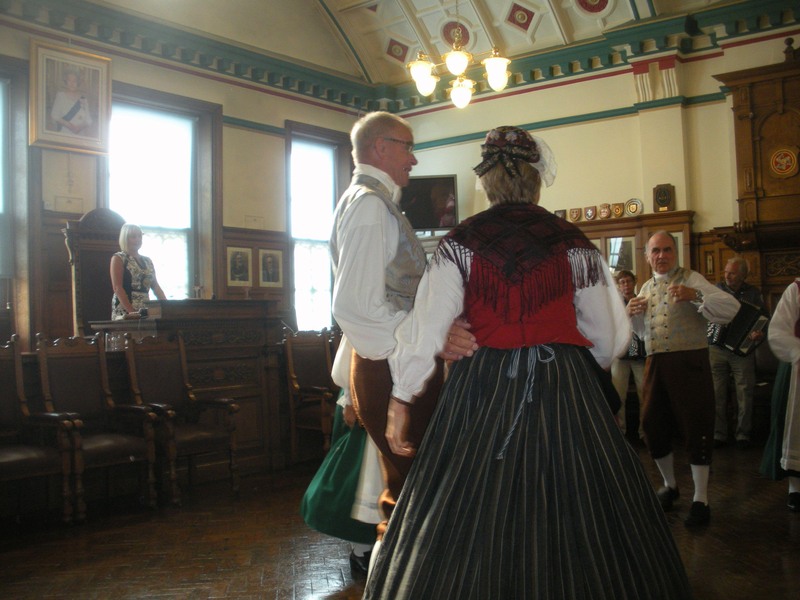 In the evening there was a buffet and an exchange of dances in Onchan. On Sunday the Visby dancers & musicians took the Electric Tram to Laxey – the visitors were amazed to see the cars of the MFDS appearing at various places along the route! There was a quick change over to a reserved Car on the Snaefell Mountain Railway for a run to the top of the mountain with some of MFDS. The tram stopped in line with the Laxey Wheel for a photographic opportunity, before continuing to the top. It was windy – especially for those who wanted to walk to the very top! The mist kept swirling in and out and unfortunately they could not see all 7 Kingdoms, but there were fairly good views of the Island at times. Then they all took the opportunity to get a hot drink before the journey down again. Lunch was at the Corn Mill followed by some free time in Laxey, when many took the chance to get a close-up look at the Lady Isabella. Then it was back onto the Electric Tram to continue the journey to Ramsey and some free time at the Mooragh Park. A fish and chip supper was arranged, with more dancing after the minibus drive back to Onchan. It was an early start on Monday morning for a ride along the Promenade on the first Horse Tram of the day, pulled by Steve, the horse! With black clouds threatening, both groups walked up to the Douglas Town Hall to meet Her Worship the Mayor, Councillor Carol Malarkey JP. After signing the Visitors’ Book they were taken into the Council Chambers, where the Mayor welcomed them. 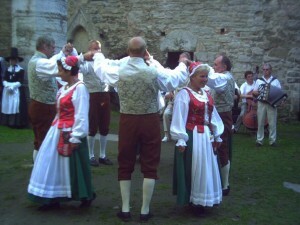 The Visby Folkdansgille performed 3 dances and presented her with gifts from themselves and their own Council. The Mayor presented both the Visby Group and MFDS with Douglas Town Plaques. The local MFDS group gave the Mayor a copy of their new DVD based on their 60th Anniversary International Dance Festival Concert held in the Villa Marina in 2011. Then refreshments were served. At about 12.10pm both groups danced inside the Strand Shopping Centre for about 1 hour – there had been a heavy shower of rain just as they arrived! The Manager of the Strand, John Shakespeare, was most helpful and even playing the Bagpipes for MFDS to perform the dance Eunysagh Vona out in Granville Street! 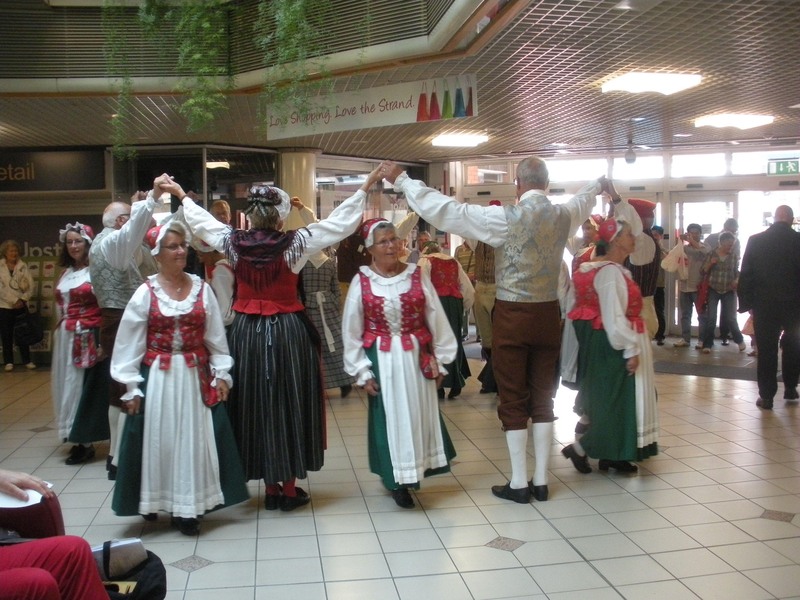 Everyone – dancers, musicians & spectators seemed to enjoy themselves! The Swedish visitors then had free time until the evening, when a Buffet and some dancing – in a rather compact area! was arranged at the Hydro Hotel. 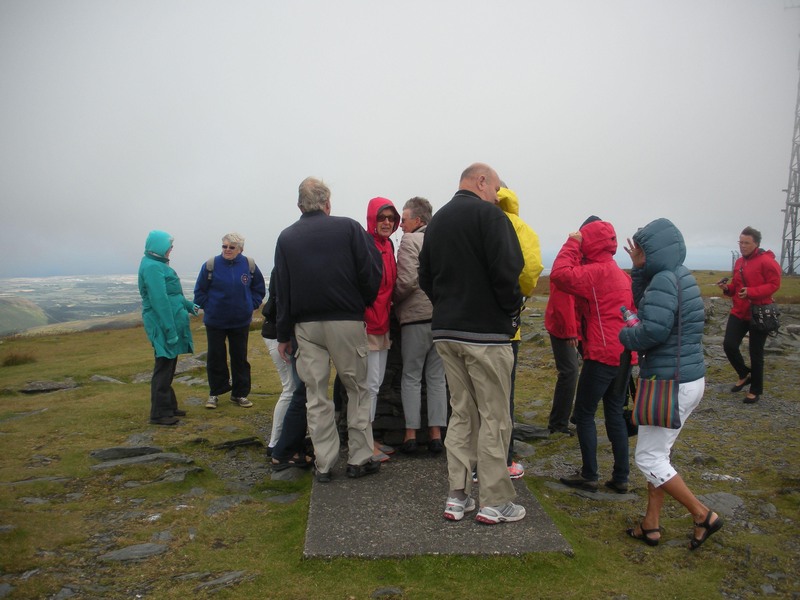 The next morning, Tuesday 13th August, the minibuses & cars picked up the Gotland visitors and their luggage, to head down to Cregneash, in particular to see the magnificent Loaghtan Ram, by the Café, before continuing down to the Sound to admire the view over coffee & cake. After a quick drive through Port St Mary, Port Erin for a photo stop and a drive through Castletown Square, lunch was arranged at the Whitestone Inn, Ballasalla. Then a quick drive to Derbyhaven before the visitors had to check in at Ronaldsway Airport at about 3pm. There were lots of hugs and kisses and even a few tears as goodbyes were said and Visby Folkdansgille disappeared into Security to begin their long return journey. After a busy long weekend, there were many tired, but happy dancers and musicians – local & visitors wending their way home! !